With Christmas and New Year's nigh, it is time again to reflect on what has been a most incredible and rewarding journey. It's almost hard to believe that I am about to start my 14th year as an online entrepreneur, affiliate marketer and coach. But that achievement would have been impossible without you — my readers, students, clients and customers. So, to all those who have followed me throughout the years, asking questions that inspired me to persue greater knowledge to share, I say a great big THANK YOU! With heartfelt gratitude, I wish you and yours a very Merry Christmas and a Happy, Healthy and Prosperous New Year. Merry Christmas and a Happy New Year Ros. sorts of things to make money online. who really inspire me like yourself. 14 years? Doesn’t time fly when you’re having fun? I wish you a all the best in the new year when it comes. merry christmas ros and thank you very much for all your effort,i have learnt so much from you,please stay in with. 14 years? My.. that’s quite a long time. Congratulations! I’ve been online for just a few years. My one true challenge is to be consistent. However, thanks to you and your excellent tips, I hope I will have the drive to be consistent and persistent in 2011. I’m doing this full time in 2011! Have to make it! No buts! No complaints! Thanks for all the awesome value you share ( paid and free ) to help guide us on this great journey to success. A belated Merry Christmas, Ros, and thanks for the inspiration! 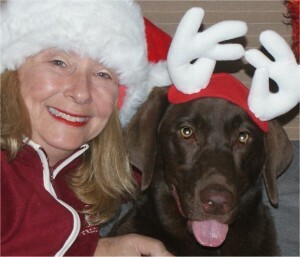 Great holiday picture including the Lab with the reindeer ears. Just wanted to wish you Happy Holidays! Merry Christmas to you, too, Ros. Thank you for an enjoyable journey. Looking forward to more fun in 2011. Happy travels in 2011 and beyond! for providing this valuable resource! All the Joys of the Season to you and yours. That’s a wonderful realization to make and I’m happy to have a part in that. Take it as far as you can go and best wishes to you and yours for a wonderful 2011. Hello Ros! Merry Christmas and happy Holidays to you. May your new year be safe and prosperous! Thank you for all of your great products as well. Take care. Thanks for the greetings and best wishes to you and yours for the best year ever! Wish you sucess but most of all Happiness for 2011. I believe that happiness is the best we can wish to anyone because it is the sum of everything ,right? Thank you, Luis and I agree. Happiness is the ultimate goal. At some point I’ll have to chat about that subject on my personal blog. The origin of the word makes so much sense. Happy Holidays to you Ros! I have to thank you too. I read your book back in May and it opened a whole new world for me. I hope we’re both still doing this in 14 more years! Merry Christmas Rosalind and thanks for all your insightful blog posts in 2010! Jasper is cute and he knows it. A really lady killer that doggy. Best wishes to you for a wonderful holiday and 2011. Ros, I wish you a very merry Christmas! Just watched your UPO video and was really nice good content! It was a real pleasure spending time with you in Dubai and hope to see you next year at a conference or elsewhere. You’re a very special, inspiring and fun lady! May all your wishes come true in 2011. As soon as the Holidays are over we’ll do the pending webinar. Best wishes for Christmas. We’ll definitely do the pending webinar ASAP. (I’ll be in Vegas with a solid connection as of December 30th) and whether it’s a conference or ‘family vacation’ we’re sure to connect in person again. You’re too much fun! Thanks from the bottom of my heart and best wishes for Christmas and a wonderful 2011 to you and yours.